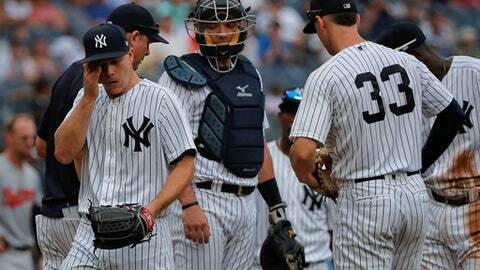 NEW YORK (AP) Sonny Gray was chased in the third inning by the team with worst record in the majors, big league-loss leader Alex Cobb ended a nine-start winless streak and the Baltimore Orioles beat the New York Yankees 7-5 on Wednesday. Cobb (3-14) had been 0-7 since winning at the New York Mets on June 5, losing his last five outings. He breezed against the Yankees with an early 7-1 lead, allowing one run and seven hits in six innings and stopping Baltimore’s streak of 11 consecutive road losses. SEATTLE (AP) – Marwin Gonzalez hit two of Houston’s four home runs, and the Astros knocked Seattle Mariners from the lead for the second wild card in the American League. After a five-game losing streak, the Astros rebounded to win the final two games of the series. Houston has a five-game cushion over Seattle in the AL West and dropped the Mariners into a tie with surging Oakland for the second AL wild-card spot. Seattle led the A’s by 11 games in the middle of June, but has seen the entire lead disappear over the past six weeks. PITTSBURGH (AP) – Cole Hamels had little trouble in his return to the National League, keeping Pittsburgh in check over five innings to lead Chicago. Hamels (6-9), acquired in a trade with Texas last week, gave up one unearned run on three hits. The four-time All-Star struck out nine and walked two to pick up his first win for a National League team in more than three years. Willson Contreras went 3 for 4 with a home run and three RBIs for the Cubs. Jason Heyward and Ben Zobrist had three hits apiece while Kyle Schwarber and Javy Baez each added two hits and an RBI for Chicago. The Cubs wasted little time jumping on Pittsburgh rookie Nick Kingham (5-6), touching him for four runs in the first inning to give Hamels plenty of breathing room. Kingham needed 51 pitches to get through the first and didn’t come out for the second. WASHINGTON (AP) – Tommy Milone worked seven strong innings to get his first win in more than a year, Anthony Rendon homered and Washington beat New York to move back above .500. Filling in for the injured Stephen Strasburg, Milone (1-0) mixed his pitches effectively and faced little stress in the second start of his second stint with Washington. Kelvin Herrera got the save after allowing Wilmer Flores’s ninth-inning homer. Jose Reyes homered from both sides of the plate for the Mets, his 11th career multihomer game and his first since Sept. 8. MINNEAPOLIS (AP) – Carlos Carrasco struck out 10 in 7 1/3 innings, winning his fourth straight start since returning from the disabled list to carry Cleveland past Minnesota. OAKLAND, Calif. (AP) – Sean Manaea pitched effectively into the seventh inning, Jonathan Lucroy drove in four runs and Oakland completed a season sweep of Toronto. Manaea (10-7) allowed five hits, struck out five and walked two. The A’s won all seven games between the two teams for their first season sweep of the Blue Jays. DETROIT (AP) – Jose Iglesias drove in three runs, Jim Adduci homered and Detroit survived the loss of pitcher Mike Fiers to an early injury to beat Cincinnati. Fiers left after the second with a bruised left shin, sustained on Mason Williams‘ comebacker. X-rays on Fiers’ shin were negative, and it was unclear whether he will make his next scheduled start. ST. PETERSBURG, Fla. (AP) – Willy Adames homered and drove in two on the day Tampa Bay gave him the regular shortstop job. Adames drove in a run with a two-out single off starter Nick Tropeano (4-6) in the fourth inning, then scored on Mallex Smith’s triple. Adames led off the sixth with his fourth home run to make it 4-2. Jake Bauers added a two-run homer in the ninth for the Rays, his ninth of the season and third in three games. Jake Faria, pitching for the first time since going on the disabled list with a left oblique strain June 22, got the win in the third relief appearance of his career. Faria (4-3) gave up one run on four hits in 3 2/3 innings. CHICAGO (AP) – Alex Gordon hit a two-run homer and drove in four, helping Kansas City pound sloppy Chicago. Dylan Covey (4-7) was charged with seven runs, four earned, and five hits in 4 1/3 innings, dropping to 1-5 with an 8.89 ERA in his last six starts. LOS ANGELES (AP) – Yasmani Grandal hit a two-run homer – his second of the game – in the 10th inning, rallying the Dodgers past the Brewers to snap a three-game skid. The Brewers tied it 4-all in the eighth. Mike Moustakas doubled off reliever Scott Alexander, who gave up three walks – one intentional – before Manny Pina singled in Ryan Braun.